Welcome to the Business Partner resources page! Here you will find all of the information you need for making the most of your NAHAM business partner membership. Thank you for your support of NAHAM! We appreciate your continued participation and value your membership. Your business partner membership offers countless ways to save! Check them out. Please feel free to contact us with any questions, concerns or feedback. We can be reached at (202) 367-1125 or info@naham.org . Let your customers know that you support NAHAM! Click here to download this badge for your website or email signature. To make plans for 2019, please contact NAHAM Senior Sales Manager Dave Merli, dmerli@naham.org or (202) 367-1219. 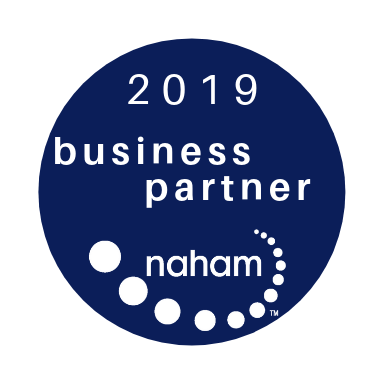 View our Partner With NAHAM page for information about advertising in the Access Management Journal or Connections. Business partners receive 15% off the cost of advertising! For more information about advertising, please contact NAHAM Senior Sales Manager Dave Merli, dmerli@naham.org or (202) 367-1219. Sponsored webinars are available for $2,500 for NAHAM Business Partner members. This is a great way to promote your business and offer educational opportunities to NAHAM members. Click here for more information. Send an email message to the NAHAM database of members and CHAM and CHAA certificants - more than 8,000 patient access professionals! This opportunity is available for $2,000 per sponsored email for Business Partner members. Click here for more information. Click here to download the mailing list request form. As a Business Partner, you are allowed one free full member mailing list (mailing addresses only) per year, upon request. If you wish to purchase additional lists, you'll receive 15% off the cost ($.55/name). Business Partner members can access the NAHAM member directory. Use the advanced search tool to search by bed size, facility type, department, and many other fields. *Please note that you must be logged-in to the website to access the member directory. CHAA and CHAM certificants are required to obtain a certain number of contact hours in order to maintain their certification. Now, you can provide NAHAM contact hours at your local events and through other educational events. Click here for more information. One benefit of the business partner membership is the ability to add your employees and colleagues as sub-accounts, which allows them all of the benefits of membership. Each individual receives their own profile, unique user name and password. Add your employees today! Looking for something else? Contact us, we're happy to help! We can be reached at (202) 367-1125 or info@naham.org.